AKIPRESS.COM - Real GDP growth accelerated from an annual average of slightly above 1 percent in 2015-16 to about 4 percent in 2017; this momentum carried through to the first quarter of 2018 when GDP expanded by an estimated 4.1 percent, the World Bank said. The improvement in economic performance was mainly the result of an improved performance by the oil sector, as oil output was boosted from oil fields not included in OPEC-led cuts. Together with more favorable terms of trade, this generated positive spillover effects to the non-oil manufacturing and services sectors. On the demand side, an improvement in net exports was a key contributor to the higher rate of GDP growth. This resulted in an improvement in the current account balance and more fiscal revenue flowing to the Oil Fund. Consequently, the tenge continued strengthening in real terms. Meanwhile, domestic demand remained subdued, leading to a moderation in inflation. 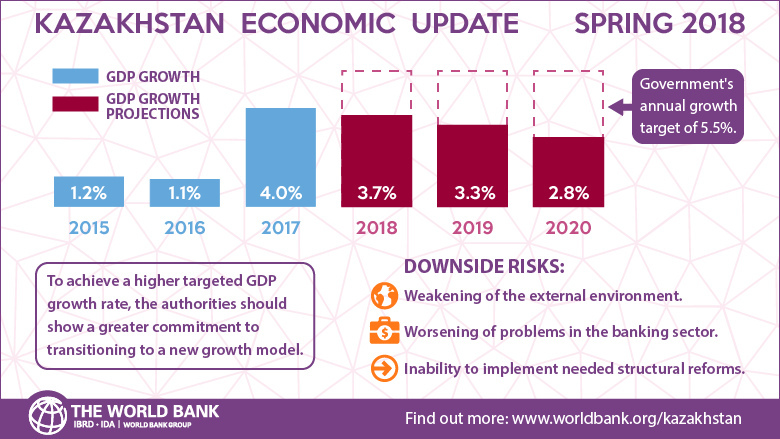 The World Bank’s real GDP growth forecast for 2018 has been revised upward, from 2.6 percent (in the previous Fall 2017 Economic Update) to 3.7 percent, due to better-than-expected oil prices and output. Over the medium-term, the real GDP growth rate is expected to hover around 3 percent, as the contribution of the oil sector to economic growth declines relative to 2017-18 (when a structural shift in oil output occurred). With oil prices projected to reach US$ 65/bbl on average in 2018-20, the current account balance is also projected to improve, from deficits in 2015-17 to surpluses in 2018-20. The fiscal position will improve gradually in the wake of fiscal consolidation efforts. Downside risks to the outlook include a potential weakening of the external environment (driven by mounting geopolitical tensions), a worsening of problems in the banking sector, and the government’s inability to implement needed structural reforms. The successful implementation of structural reforms will be required to deliver more sustainable and inclusive economic growth going forward. Ongoing structural and institutional reforms should aim to transform the current oil-driven and state-run growth model - by reducing the role of the state in the economy - to one that facilitates the development of a vibrant, modern and innovative tradable non-oil sector. In this context, efforts to restructure and privatize state-owned enterprises would be expected to focus on improving the efficiency of public administration, reducing fiscal risks, and opening competitive spaces for the private sector. Prudent fiscal and monetary policies would support economic and price stability and encourage investment in the non-oil economy. Attracting and retaining more export-oriented and efficiency-seeking investment would be critical for economic transformation.